These are still discounted prices BUT there is shipping on each item. This ppage has been redone but make SURE you check your shopping cart. WE NO LONGER SELL OEM COLORS WITHOUT A SAMPLE. The fact that the OEM Sample we have does not match what was put in your car is NOT because we do not have the correct COLOR it is the fact that the FACTORY will use what they have and call it that color. Example is 3218 Saddle there are 4 versions of this color. Steering Wheel Kit Please note that you have color Options. The Standard Kit is in Black or a Leatherique Standard Color WE DO NOT CUSTOM MATCH any colors for this kit. Our popular 32 oz Super Saver for Rejuvinator OIl and Prestine Clean. You get a 32 oz bottle of Rejuvinator OIl and a 32 oz bottle of Prestine Clean for one low price. 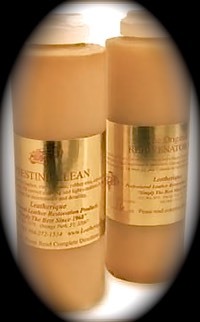 Our popular 16 oz Super Saver for Rejuvinator OIl and Prestine Clean. You get a 16 oz bottle of Rejuvinator OIl and a 16 oz Bottle Of Prestine Clean for one low price. 16 oz of our Famous water based dye for re-dying of your leather or vinyl. Please look at the Standard color list if you are matching to an OEM color then you need to contact us about IF it is a standard OEM or we need you to send a sample. The dye is $55.00 OPtion selections allow you to COMMENT in the text portion about your color NUMBER for your car at the $55.00 price. The $85.00 price is for when you send a SAMPLE with your order. These dyes ARE NOT returnable EXCEPT for a rematch. 32 oz of our Famous water based dye for re-dying of your leather or vinyl. Please look at the Standard color list if you are matching to an OEM color then you need to contact us about IF it is a standard OEM or we need you to send a sample. The dye is $95.00 Option selections allow you to COMMENT in the text portion about your color NUMBER for your car at the $95.00 price. The $115.00 price is for when you send a SAMPLE with your order. These dyes ARE NOT returnable EXCEPT for a rematc hwith a swatch. 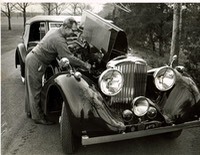 Klear Kote Developed by Leatherique for the automotive industry. This is a BRUSH OR SPRAY application of a polymer KLEAR KOTE used to protect surfaces. NOT recommended for outdoor application (vinyl tops). Will make CANVAS WATER REPELLENT. Great for sealing an older canvas top. (can turn milky on dark colors when wet. Developed for the EXTRA SHINE that some people want in a finish.